An Upper-Egyptian clan robs a cache of mummies and sells the artifacts on the illicit antiquities black market. After a conflict within the clan, one of its members goes to the police, helping the Antiquities Service find the cache. This compelling tale of love and betrayal, set in the upper Egyptian countryside, follows the story of Amna as she plots her revenge on the engineer who destroyed her family's honor. It's not hard to see why "Cairo Station" was banned for 20 years in Egypt. It gained much recognition in Berlin, being nominated for the Golden Bear and Chahine missing out on the Best Actor prize on a technicality, but in Egypt the audiences, used mostly to the romantic comedies and melodramas Egypt's massive film industry was expected to release, found the film's darkly sexual nature disturbing, and the censors reacted in an even harsher manner. Expectations for the film were probably even further away from the finished product since the film starred Farid Shawqi and Hind Rostom, two big stars of the Egyptian cinema. Everything you hear about the film from Chahine and from Egyptian film scholars suggest that he put his heart and soul into making this film. If the gritty yet stunningly well-orchestrated visuals don't convince you that's true, then Chahine's passionate, masterful portrayal of the main character surely will. It really is one of the greatest performances of all time, and that's fairly surprising coming from someone who chose to stay behind the camera for most of his long career. There's not a single moment where you don't completely believe the character and the character's motivations and feelings, Chahine is just THAT good. The storyline itself is nothing to write home about unless you view it within the context of Egypt when the film was released. The film is very reflective of the pent-up frustration that many Egyptians felt (one could even say that inner turmoil of the main character is completely intended as a reflection of Egypt before Nasser took over), and the events surrounding the main plot are hugely reflective of the transition Egypt was going through (in one spectacularly stylized scene Qinawi looks on as rock n' roll is celebrated Egyptian-style inside a train carriage). There are some brilliant moments throughout the film, but Chahine's handling of the final twenty-odd minutes are beyond brilliant. For one, he handles the change of tone spectacularly well, and his performance certain helps here. It's remarkable to watch a film directed by its star in which the actor's performance and the director's work feel so intrinsically connected- when Chahine the actor is dancing to rock and roll, Chahine the director is wonderfully playful, allowing the camera to move freely and capture the energy and enthusiasm of the scene. When Chahine the actor is at his most vulnerable and sexually obsessive Chahine works the film into a tense, spectacularly well-edited frenzy. This isn't Chahine's first film, but it is quite possibly Chahine the auteur's first film. 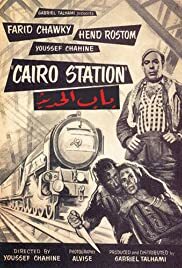 Although it contains a fair bit of Lang and a little Hitchcock (it is remarkably similar in its final stages to Hitchcock's "Psycho", which would only come out two years later, even some of the editing is similar), the film is mostly Chahine, looking at Egypt as only he can. "Cairo Station" is a film of remarkable depth, filled with great characters and wonderful performances, and featuring a spectacularly tense score. Beyond all that it is a film of immense technical precision and of unparalleled passion, and it is unquestionably the work of a master. A perfect film, the greatest Arabic-language film ever made, and one that I would personally rank as one of the greatest films made anywhere by anyone.